When you watch track and field competition on TV, two things that are often mentioned by a commentator, the time or distance achieved by performer and then the wind reading. Why? This is simple, no matter how fast you ran or jumped, your performance would not be considered "legal" when the wind reading is not within the legal limit. Mentioning the wind reading can give an immediate feedback to fans and stakeholders as well so they will have an idea whether somebody has set a record (PB, NR etc.). Not all events require wind gauge, the use of this instrument only apply to these events, 100m, 200m, 110mh, 100mh, long jump and triple jump. Wind reading is expressed in metres per second (m/s). A positive reading (tailwind) means the wind direction is from behind (which helps increase velocity), while a negative reading (headwind) refer to the a wind that blows against an athlete as he/she move forward. In the affected events, all the "negative wind" such as -0.5, -1.8, -3.0 are considered "legal", while "positive wind" would only be considered legal when the reading is not exceeding +2.0, means that +2.01 would be illegal and performance may not be ratified (as new record). For sprints and hurdles, the anemometer (wind gauge) must be placed at 50m mark (just adjacent to lane 1) before the finish line. It should be measured (to start recording) from the start of race (100m - 10s duration and 110mh - 13s), or the last 100m for the 200m event (10s duration). You don't have to worry when do you stop it, it will operate (when you push button for the manual wind gauge) and stop automatically (pre-set the duration). For the jumps, it should be placed at 40m (long jump) or 35m (triple jump) distances from the take-off line, and measured for 5 seconds from the commencement of the run or when the athlete crosses the anemometer. One main setback in Southeast Asian competitions has been the lack of awareness and concern among the organizers/officials regarding the importance of wind gauge. This will be further elaborated in this article. Before I go any further, you should know this - operating the anemometer or wind gauge is actually the most easiest technical job in an athletics meet. What are their significance in the relation of athletes' performances? 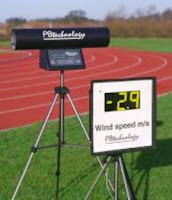 It has been shown that the advantage (and disadvantage) of every 0.2m/s of wind is about 0.01 second. It means a 0.5m/s of tailwind would help athletes to run faster by approximately 0.025s, whereas a headwind -0.5m/s would cost the athletes' time by 0.025 (same amount with tailwinds). In women's 100m, higher advantage and also disadvantage were found with the same amount of winds. Perhaps, bodyweight factors contribute to the finding. --> Tailwind: +1.0 = 0.07s ,+2.0 = 0.12s. --> Headwind: -1.0 = 0.07s, -2.0 = 0.12s. Obadeli Thompson 9.69A (+5.7) in 1998. PB at the time 9.87A (-0.2). ---> Exact time: 9.90s (slower than his PB). #Both (9.69 and PB) are achieved at altitude which should requires more specific/different calculation, but I will discus about "advantage in performances at altitude" in the next time. 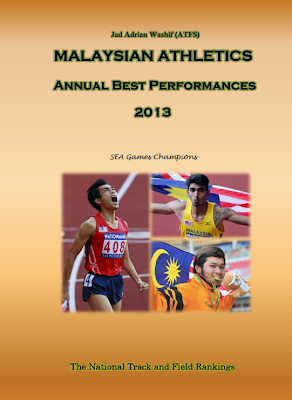 Norjannah Hafiszah (Malaysian sprinter) 11.60s (-1.5) in 2011. Will she break the NR 11.50s held by G.Shanti? If her time was really accurate (timing system was not malfunction), yes that's the possibility. ---> Possible time: 0.0 (no wind) = 11.53s, given with +1.0wind = 11.48s (yikes... NR!!). Click here to adjust / calculate / estimate your real time for 100m. 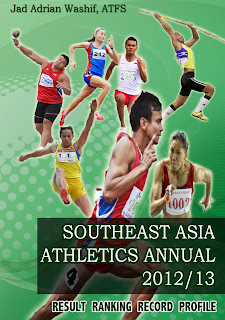 In 200m sprint, the calculation involves wind reading, the lane, and altitude if relevant. Above information is not considering altitude and lane effects. Perhaps I'll need to discus about the altitude and centrifugal effect (lane/curve effect) in the next post. Case: Leroy Burrell of USA ran 19.61s at Texas in 1996. This performance was better than the WR at the time (19.72s by Pietro Mannea). But it was not ratified due to "too much wind assistance" (+4.0). 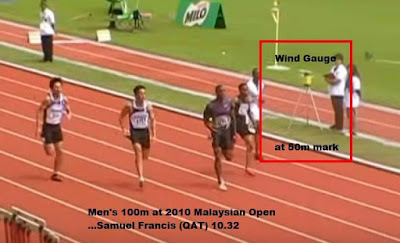 However, when you perform the wind adjustment (0.0), his time would only be around 19.83s. Click here to adjust / calculate / estimate your real time at 200m where you can include all factors (wind, lane, altitude). It was indicated that a +2.0 tailwind would give an advantage to long jumpers by at least 5cm and can be up to 16cm (men). Bob Beamon comes to mind. Bob Beamon's 8.90m performance has been contributed significantly by the (maximum allowable) tailwinds (+2.0m/s) by approximately 16cm, in addition to another 12-14cm advantage from the thinner-air at altitude. The rest was his efforts, of course. I witnessed a massive jump of 8.78m during the Australian championships last year. It was registered by Fabrice Lapiere who has a current PB of 8.40m (8.35m before the 8.78m). It was a wind-assisted performance (+3.1) but it also shows that bigger winds could possibly help athletes jump with even further distance, more than to what has been anticipated in research papers? From the above, wind reading has not been a big deal and were not entirely measured (or reported) in several-to-many competitions in Southeast Asia (see W.R.M = number of meets with wind gauge, and used it for wind measurement). At the same time, several competitions which have actually measured the wind speed (again see W.R.M) didn't bother to report the reading (see W.R.M.R = number of meets that actually reported the readings). 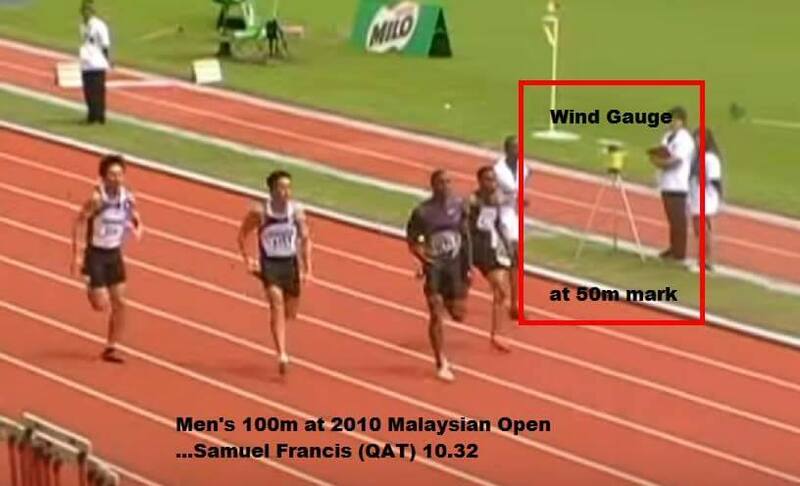 One example based on above, out of many competitions in Malaysia during the year, only 2 out of 10 competitions have the wind speed measured, but unfortunately only 1 out of the 2 has taken initiative to report the readings (in official results). This means that from many competitions held in Malaysia, you will see only one (or maybe just a few) official results that included the wind information of all the affected events. Wind gauge is compulsory (by rules) in track and field meets and its reading must be reported along with the official results. If not the case, the athletes and coaches will have difficulty to do performance analysis and they do not know whether there is improvement from one season to another. 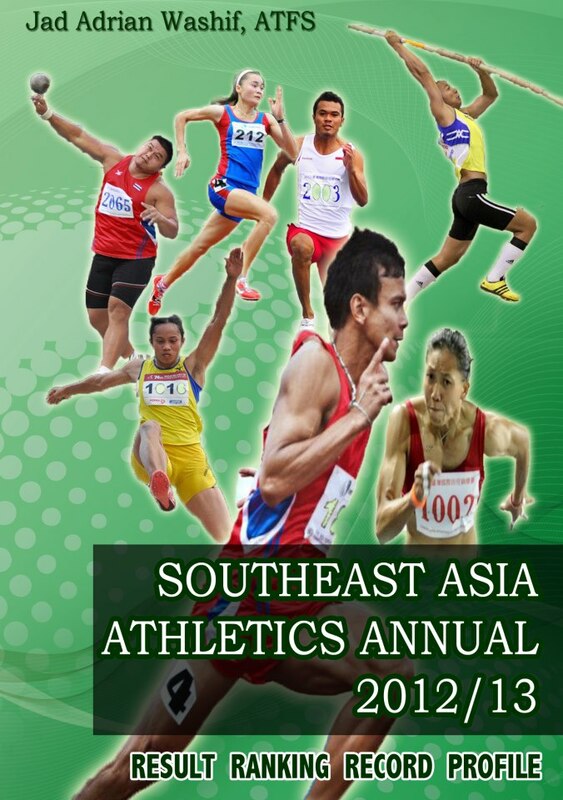 Therefore, track organizers must consider this matter very seriously for the benefit of athletes and coaches. Wind reading information is very useful for tracking the seasonal performance's fluctuation. Besides, operating the wind gauge is the most easiest work in athletics meet.